632 pages, Suggested retail price, $44.95. ISBN 0972177027. Are you still wasting money on the wrong kinds of poultry feed? Your poultry depend on you to make sound decisions about their health, but the feed industry and poultry nutrition are mysterious subjects. 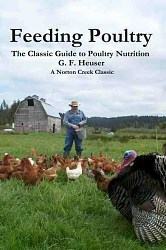 Let Feeding Poultry be your guide! Pioneering poultry scientist G. F. Heuser of Cornell University wrote Feeding Poultry at just the right time: after poultry nutrition was thoroughly understood, but before small farm flocks were replaced by factory farms. It may not be the newest book available, but it’s the only one with a whole chapter devoted to free range and green feed, that’s focused on traditional poultrykeeping, and written for the intelligent layman rather than graduate students. Feeding Poultry is the ideal reference for small farmers and serious hobbyists like you, covering chickens, turkeys, ducks, geese, gamebirds, and pigeons. As you read this book, you will see opportunities open up before you. You’ll learn the uses and quality standards of different ingredients, the value of free range and green feed, how poultry rations are formulated, how to use natural sources for all nutrients, the many different feeding strategies, and much more. Other books on poultry nutrition cost twice as much for far less material. Even if you never mix your own ration, your superior understanding will give you more options, make you a better shopper, save you money, and allow you to keep healthier, more productive poultry. How to mix your own feed rations. The value and limitations of range as a source of nutrition. The use of whole grains. What nutrients different breeds of poultry need at different ages. Getting vitamins and minerals from natural feedstuffs rather than supplements and premixes. Where to get the necessary nutrients in a cost-effective way. How to spot nutritional problems. Where to go for more reading. Each chapter has a comprehensive bibliography. This book dates from 1955, which was after all the major nutrients were discovered (vitamin B-12 being the last one) and also after soybeans had begun to be used in a big way. Coccidiostats, hormones, and antibiotics were also in use, but they were new enough that they are treated in the text as optional extras. The discussion about them is fascinating, even if you don’t like using these additives. On the other hand, 1955 was still the period of small family farms, and the text is written with small producers in mind. This is not a dry treatise aimed only at professional feedmeisters, but gives every consideration to the use of range, cheap local grains, locally available byproducts, and on-farm feed mixing. Similarly, Feeding Poultry lists the actual ingredients you should use to get balanced vitamins and minerals, rather than simply saying that you should add a vitamin/mineral premix. So you can learn all about practical vitamin and mineral sources from this book. This is no longer usual. past with an important part to play in our future. Order on Amazon or see our How to Order page.